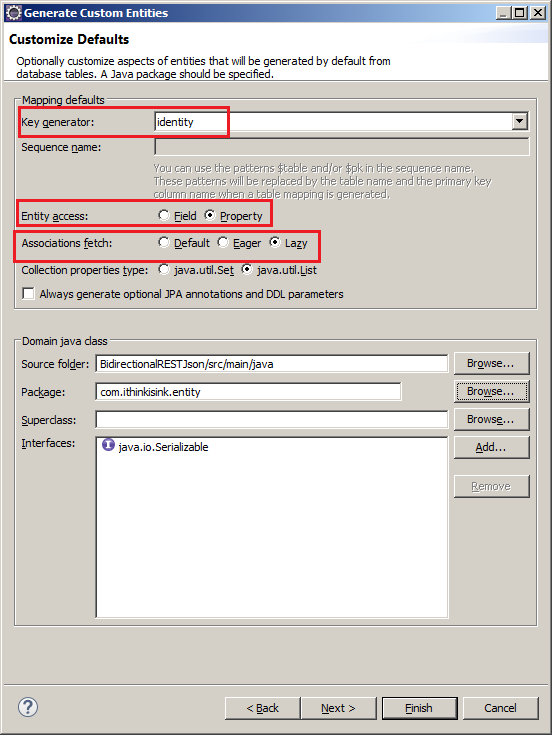 This is an example for a Bidirectional relationship between Java entities in a REST web service with the Jackson API. 1- Assume we have a bidirectional relationship between two entities Parent and Child. 2- Using MySQL workbench to generate the SQL schema file for this two tables. 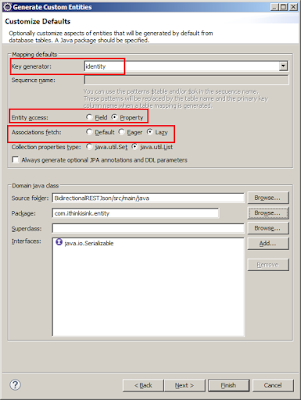 4- The Maven dependencies for the Jackson API that are required for this example. Also, you can pick up your required Java EE dependencies from this link. 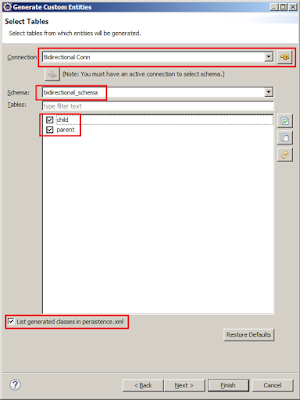 5- Using Eclipse to generate Entities from the above tables. 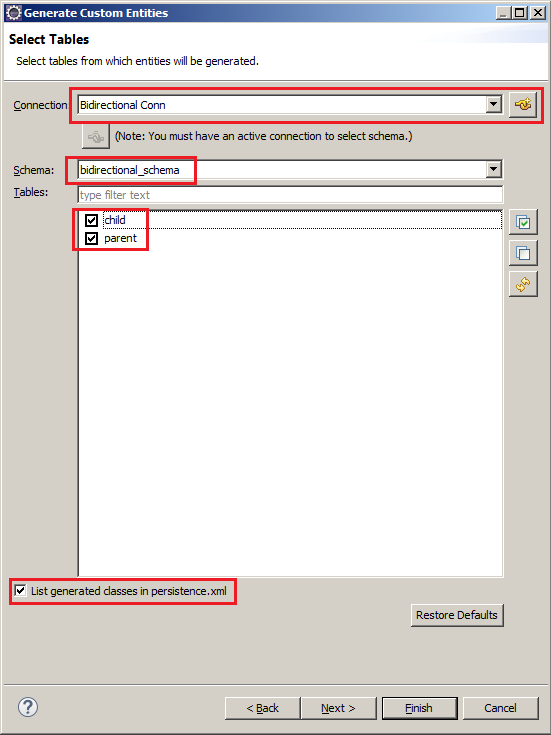 File -> New -> Other, then from the wizard choose JPA Entities from Tables. 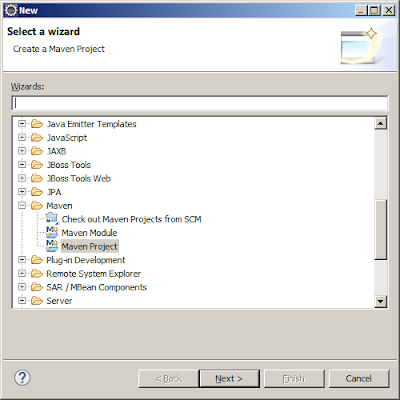 A wizard will show up to create a connection to the schema that's already created. Then select the two tables child and parent. Finally make sure that the "List generated classes in persistence.xml". 6- There is nothing fancy about the persistence.xml. But there are two points to consider. 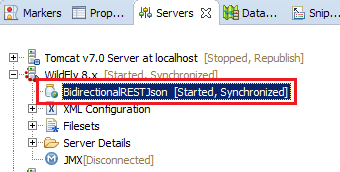 First, I didn't specify the persistence provider as I tend to use WildFly so the application will use the default persistence provider which is Hibernate. 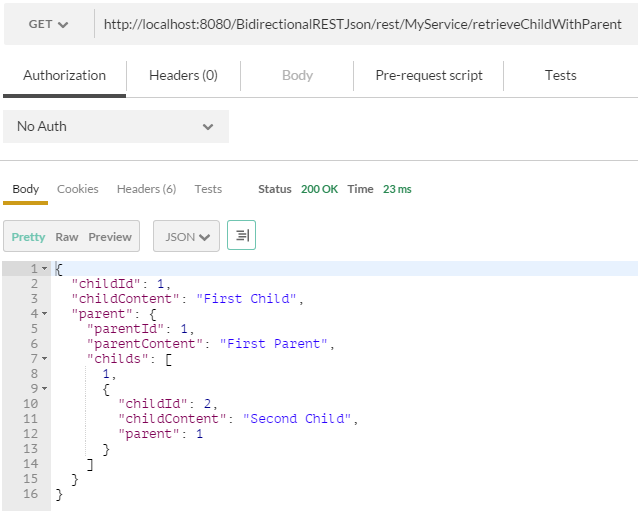 Second, I created a datasource on WildFly so that it can be used to connect to our schema. Thirds, I used EclipseLink that's why I'm using this JPA provider org.eclipse.persistence.jpa.PersistenceProvider. Check this post to point WildFly to EclipseLink. 7- The first class that we will implement is the ApplicationConfiguration class that will point to the parent path of our coming REST services. 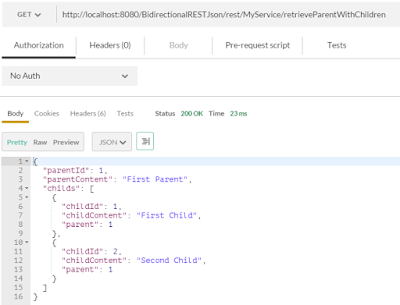 8- Then we will create MyService class that will have two REST web services. The first will retrieve a parent with a children fetched. The second one is an opposite to this and will retrieve a child with it's parent fetched. 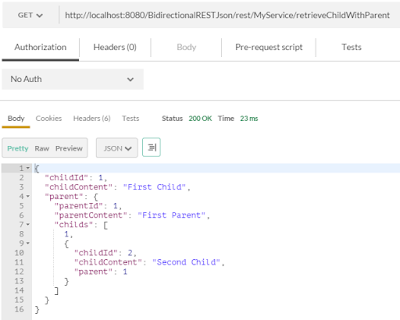 9- Then we will create ServiceDAO and notice that the EntityManager is injected with a connection to the persistence unit that we already defined in the persistence.xml. I passed the name of the persistence unit to make this point clear. But you can just use the annotation @PersistenceContext without specifying the unitName attribute then it will use our persistence unit because there is no other persistence unit defined in our application. 10- Now that our application is ready for testing will add it to the WildFly server. Then starting the server should be successful. 11- For the sake of simplicity, I used Postman to test the running REST web services. So bellow are screenshots from the result on Postman.